When I missed my connecting flight from Frankfurt to Geneva, a very traditional part of me was thinking ‘if I have started with this, I hope my short stay in Geneva will not be as dramatic’. My experience turned out to be a huge blessing. The first day at the World YWCA office surpassed my expectation. The homely arrangement that gives you this comfortable sense of belonging and the very warm members of staff coupled with the efficiency with which programs were being run had a huge effect on me. 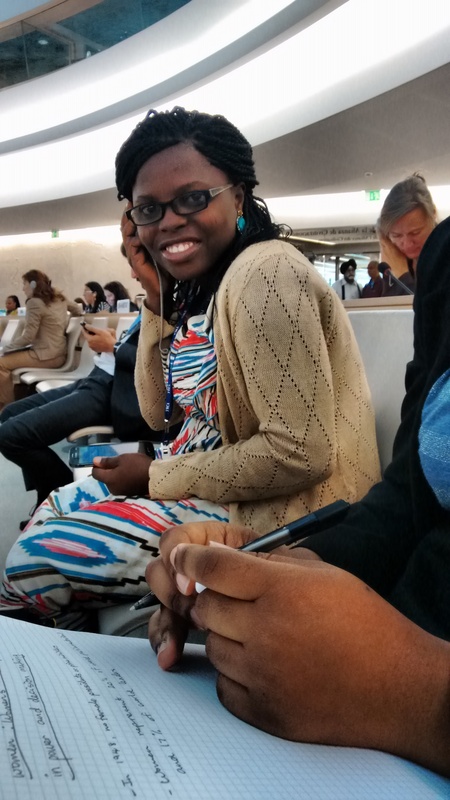 My fellow short-term intern, Lucrece Falolou from the YWCA of Benin and I proceeded to spending the first day of the 29th session of the UN Human Rights Council to learn more about the HRC, its key themes and events and the participation of the World YWCA. The Human Rights Council is an intergovernmental body within the UN system that has been saddled with the responsibility of promoting and protecting the rights of human around the globe. It consists of 47 member states that are elected every three years and a bureau of 5 persons acting as the President and Vice Presidents. The HRC has 10 specific agendas guiding its operations. The first three items are thematic, fourth and fifth items are country specific, item six is called the Universal Periodic Review (UPR) and finally items seven to ten are technical assistance. – Harnessing Faith and Culture: Addressing women’s rights and addressing VAW. – Addressing Child, Early and Forced Marriage: National and Regional perspectives. – Human Rights of Women: Eliminating and preventing domestic violence against women and the role of Women in economic and political decision making. – Women and Natural Resources: Realizing Women’s Peacebuilding potential through Inclusive Natural Resource Management. I also listened to the reports of the Special Rapporteurs on VAW, Right to Health and Right to Education and their emerging interactive dialogues. In addition to my experience, I had the opportunity of working with the Permanent Mission of Sierra Leone to the UN in Geneva and my major responsibility was to draft statements from the UPR of some member states, which I saw as a very great privilege. Furthermore, I had the privilege to participate as a panellist at a side event organised by the World YWCA together with its partners on “Technology and Economic Empowerment: Limitless possibilities for women and girls’ participation in the domestic sphere”. In this space I shared my experience as a young woman leader, the highs and lows of technology and economic empowerment amongst the young women in Nigeria. Because of this experience my horizon has been broadened as I now have a wider scope of the works of the YWCA. I learnt how to use a twitter handle efficiently, I had my first webinar and gain and understanding of the importance of having a healthy work-life balance. I will now return to Nigeria with a wealth of knowledge on new strategies of advocacy, improved communication skills and a better understanding of the operations of the UN. I am sincerely, thankful to the World YWCA for these invaluable experiences and also grateful to all the wonderful women in the office who have made my stay very comfortable and worthwhile.